I've always found it challenging to turn long, thin chair rungs on the lathe because they tend to flex and chatter. I used to support them with my gloved left hand while holding the turning tool in my right, but the results were mediocre at best. My solution was to build this simple steady rest. It supports long rungs beautifully, yet it takes only a couple of hours to make—and the parts cost less than S20. Unlike most other steady rests, this one supports the work at only two points instead of three, relying on the force of the cutting tool to keep the workpiece in contact with the support bearings. The rwo-point design is much quicker to set up, and the wing nuts make it easy to remove. 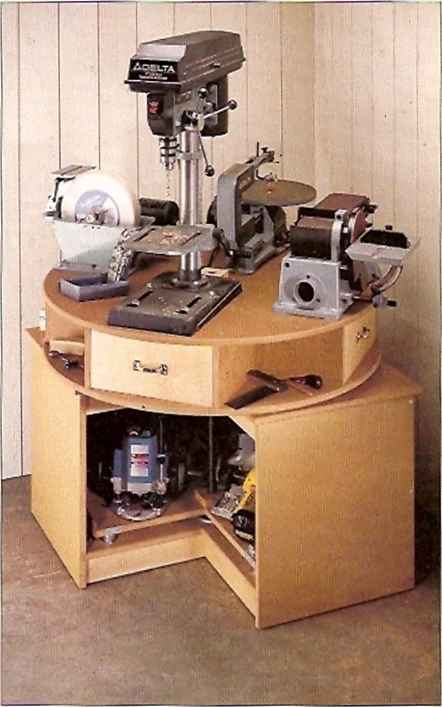 Make the steady rest so the center of the opening is in line with your lathe centers. The key attached to the base maintains the alignment. I used inexpensive, l-in.-dia. sealed bearings (available at bearing-supply houses). You can use any size bearings, but keep in mind that smaller bearings will support thinner workpieces. To use the steady rest, rough your workpiece to a cylinder, then turn the middle of the blank to finished size. (Tip: I use an open-end wrench as a convenient caliper.) With the rest in position and the lathe running, slide the bearings until they touch this center section with just enough force to make the bearings spin.